When its Indian Premier League (IPL) then people and cricketers both go crazy. So was it with, legend cricketers Shane Warne and Matthew Hayden who came up with an exclusive idea where fans are going gaga about. It was Warne that came up with a challenge for Hayden where he had to disguise himself and explore the streets of Chennai. Not just that, Warne had to buy items under Rs. 1000 too. According to Times of India (ToI), Hayden said that "it was a challenge by Warne to buy items for under Rs. 1000. That's when I had to find a make up man for disguise and went around the market to buy lungis, shirts, Rajini sunglasses and a watch." Further expressing about his day, Hayden added that "it was a fascinating experience and I am happy that I took up the challenge. I found a local boy who could help me navigate the streets. I also paid him Rs. 100 as I won the challenge that Warne had given me." Excited Hayden took to his Instagram account and posted a picture of his disguise where he is seeing having an unkept beard walking the streets of T Nagar. This challenge was taken up by Hayden, when he was in the city to do commentary for Chennai Super Kings against Rajasthan Royals. Hayden expressed that he love everything about Chennai especially the food and the fans here. ‘ஹாட்ரிக் விக்கெட் எடுத்தா இதெல்லாம் பண்ணுவாங்களோ’.. இணையத்தை கலக்கும் ப்ரீத்தி ஜிந்தா, சாம் குர்ரன் டான்ஸ் வீடியோ! Breaking !!! Former Cricketer Arrested for IPL Betting !!! ‘தல’ தோனியை அடுத்து.. ‘கிங்’கோலி படைத்த புதிய சாதனை.. உற்சாகத்தில் ரசிகர்கள்! ‘வேர்ல்ட் கப் ஜெயிச்ச அந்த தருணம்’..‘அதே ராஜநடை’..தெரிஞ்சா நீங்க லக்கிதான்.. யாருபா அது?.. வைரலாகும் வீடியோ! Kohli the worst IPL captain ever? Another Big Captain has not won the IPL!!! ICC sets a list of New Rules that can change the game!!! 'Noballs' to be called as 'Faults'!!! "Delhi lost their heads in this run chase" !!! 7 wickets 8 runs !!! This page contains news relating to various facts and events. The views are generally about current affiars and general topics in diversified areas such as political, international, national, and regional issues, sports, health, travel, lifestyle, technology and business. People having similar interets on the above topics will find this page useful. 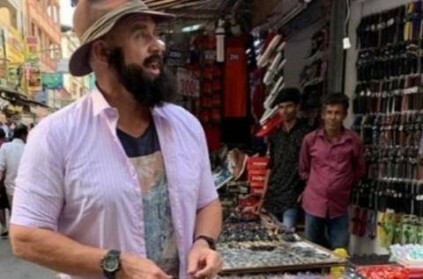 Matthew Hayden visits T Nagar for shopping, gets challenged by Shane W | Tamil Nadu News.